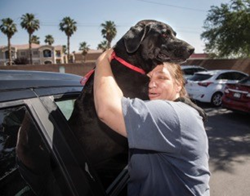 A domestic violence survivor hugs her beloved dog outside Noah’s Animal House. Two of these organizations, Noah’s Animal House and Urban Resource Institute are just a couple of the only 3% of domestic violence shelters across the country who are working to keep both pets and their owners away from the dangers of domestic abuse. Together these two incredible organizations have saved more than 1,500 pets from abusive conditions, so that no domestic violence survivor is forced to choose between staying in an abusive relationship and leaving their pet with their abuser. Up to 65% of domestic violence victims remain in abusive situations out of fear for their pets’ safety . According to the Centers for Disease Control, 4,774,000 women in the United States experience physical violence by an intimate partner every year. The majority of domestic violence situations include pets in the household, and 85% of women residing in domestic violence shelters reported a pet was harmed by their abuser . A growing body of science has demonstrated a link between domestic violence and animal cruelty . An outlet of emotional support for victims, the family pet often becomes a target for physical abuse . The PAWS Act Coalition members have been working to promote awareness and encourage support for the legislation, with 247 bipartisan co-sponsors in the House of Representatives and 37 in the Senate. There is now new momentum with the bill’s language included in the recently-passed Senate Farm Bill. The PAWS Act Coalition is especially grateful for the efforts of Senator Dean Heller (R-NV), Senator Gary Peters (D-MI), Senator Pat Roberts (R-KS) and Senator Debbie Stabenow (D-MI) for their leadership and commitment to pass the Pet and Women Safety Act. “Pet Partners therapy animal team handlers and advocates all across the country are using their grassroots power to support the PAWS Act Coalition, so that pets and people can stick together in traumatic situations - when they need each other most,” said Annie Peters, CEO of Pet Partners. Science For a Better Life: the Bayer business unit Animal Health is a global leader in animal health, supporting the health of animals, as well as the farmers, veterinarians and pet owners that care for them through its offering of innovative therapies and solutions. Responsible relationships between humans, companion animals, as well as farm animals mean taking care of their health and well-being. Bayer has secured a leadership position in researching and developing products for animal health and pest control since 1919, and is constantly developing new, better products and improved forms of administration for the benefit of the animals in our lives. Pet Partners is the national leader in demonstrating and promoting animal-assisted therapy, activities and education. Forty-one years since the organization’s inception, the science that proves these benefits has become indisputable. Today, Pet Partners is the nation’s largest and most prestigious nonprofit registering handlers of multiple species as volunteer teams providing animal-assisted interventions. Therapy animals, such as those who participate in the Pet Partners Therapy Animal Program, provide affection and comfort to members of the public, typically in facility settings such as hospitals, assisted living, and schools. These pets have a special aptitude for interacting with members of the public and enjoy doing so. Therapy animal handlers volunteer their time to visit with their animals in the community. For more information about Pet Partners, visit http://www.petpartners.org. Noah’s Animal House was the first stand-alone full service pet boarding facility in the country built on the grounds of and in partnership with The Shade Tree Shelter in 2007 to provide safety, shelter and support for the pets of the clients of the shelter. A second location serving up to 36 animals in Reno, Nevada opened February 2018 in partnership with the Domestic Violence Resource Center. In a national survey, 71 percent of women seeking safety in a domestic violence shelter reported pet abuse in their home and more than 25 percent delayed leaving because they did not have an escape plan that could include their pets. To learn more about Noah’s Animal House, visit http://www.noahsanimalhouse.org. HABRI is a not-for-profit organization that maintains the world’s largest online library of human-animal bond research and information; funds innovative research projects to scientifically document the health benefits of companion animals; and informs the public about human-animal bond research and the beneficial role of companion animals in society. For more information, please visit http://www.habri.org. Ascione,F.R.,Weber,C V., Thompson,T.M.,Heath,J.,Maruyama, M.,Hayashi,K. (2007). Battered Pets and Domestic Violence: Animal Abuse Reported by Women Experiencing Intimate Violence and by Nonabused Women. Violence Against W omen,13(4),354–373. Faver, Catherine A., and Elizabeth B. Strand. "Domestic violence and animal cruelty: Untangling the web of abuse." Journal of Social Work Education 39.2 (2003): 237-253. Matthews, Kevin, and Kelly McConkey. "Examining the nexus between domestic violence and animal abuse in a national sample of service providers." Violence and victims 27.2 (2012): 280.